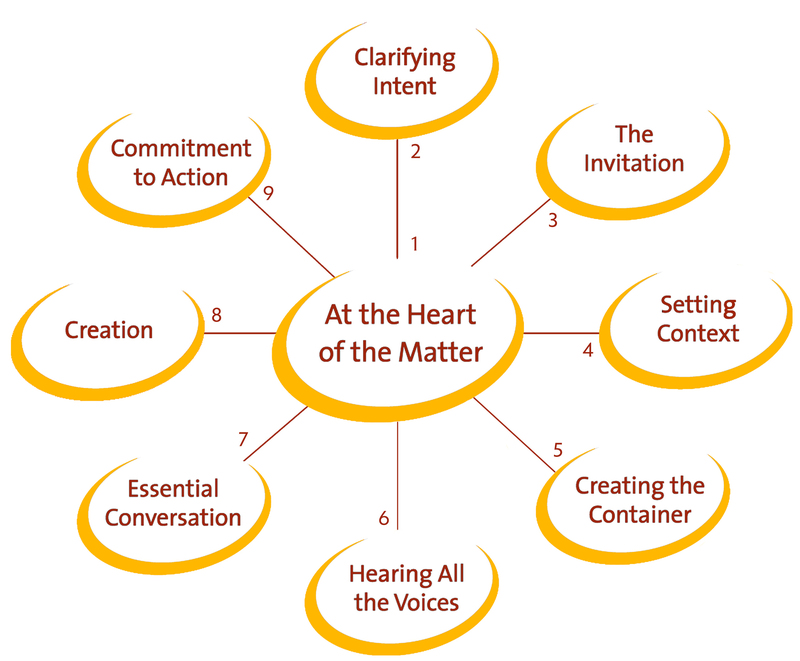 The Convening Method is much like baking a cake. Purpose is the flour, convening is the yeast. Convening activates purpose. The ingredients, all added at the right time, consciously tended in a step-by-step manner, can be successful time after time. Start with a clear purpose and success factors. A two-sentence statement will do. Your agenda comes next. It will embody your purpose along with what you are to do together to reach your success factors or intent. Your invitation simply outlines what you are to do together that integrates purpose and intent. Giving thought and consideration to the space in which you meet is often neglected. Think what would stimulate and enliven the attendees beyond all the necessary materials. In creating safe spaces for authentic engagements remember the cultural norms and what agreements you wish to have to allow people to settle in and feel safe. Once in the meeting, how many times and how many ways can all the voices be heard to allow the opportunity for full participation? Essential conversation is the result of the preparation you have put into the first 5 steps of the recipe. Here we are aware of mood and level of connection each has for engaging in the agenda. Has the space been created for mutual trust and respect? Calling for a commitment to action brings clarity to what has been agreed to. A commitment to action invites responsibility, accountability, and commitment to an individual and collective way forward. In Part 1 we gave you the recipe or the method. In Part 2, next week, the yummy ingredients!